Hundreds of HISD seniors will walk across the stage this spring during graduation ceremonies planned for May 26 through June 9. Most ceremonies will take place at various locations around the city (primarily the Barnett Fieldhouse, Butler Fieldhouse, Delmar Fieldhouse, NRG Arena, NRG Stadium, Texas Southern University campus, and Wilkins Pavilion). This entry was posted in Achievement/Recognition, News, Special events and tagged graduation on April 30, 2018 by HISD Communications. Cheers, chants, and high-fives echoed through the hallways at HISD elementary schools this week as high school seniors marched single-file past their younger peers – a tradition of “grad walks” that are gaining in popularity every year. The walks were held not only to give the seniors a sense of pride, but to help inspire the elementary students to follow on their own paths toward becoming Global Graduates. High schools that held grad walks this year include: Austin HS, Sterling Aviation HS, Northside HS, Sharpstown HS, Sharpstown International School, Wheatley HS, and Westside HS. Nearly 11,000 seniors from HISD will graduate in dozens of ceremonies across the city starting today. This entry was posted in Achievement/Recognition, Elementary Schools, High Schools, News and tagged graduation on May 25, 2017 by HISD Communications. Surrounded by his family and doctors, as well as HISD Board President Wanda Adams, Madison Principal Orlando Reyna, and staff members, senior Erick Reyes donned a graduation cap and gown for a moving bedside ceremony at Texas Children’s Hospital on Friday. Fox News was there and posted this story on their website. Erick has been suffering with bone cancer for the past two years and was recently moved to hospice care. He enrolled at Madison in 2012 and was well on his way to graduation when he was diagnosed with bone cancer. Erick struggled to continue his studies while receiving treatment but had to stop due to the severity of his illness. He went into remission and returned to campus to finish his final classes, but unfortunately, the cancer returned. Although Erick was unable to complete his dream of walking across the stage with his classmates, he was pleased to be honored with his diploma. This entry was posted in Achievement/Recognition, High Schools and tagged graduation, Madison High School on March 10, 2017 by HISD Communications. Hundreds of HISD students will walk across a stage in the spring to collect their diplomas as part of the district’s annual graduation ceremonies. Most ceremonies will take place at various locations around the city (primarily the Barnett Fieldhouse, Butler Fieldhouse, Delmar Fieldhouse, NRG Arena/Stadium, Texas Southern University campus, and Wilkins Pavilion) between Friday, May 26, and Sunday, May 28. However, a few will be taking place earlier (E-STEM, Mickey Leland College Preparatory Academy, Victory Prep – North, and Victory Prep – South on Thursday, May 25) or later (Liberty HS on Sunday, June 4), so be sure to check the schedule for times and locations at HoustonISD.org/GraduationCalendar. This entry was posted in High Schools, News, Special events and tagged graduation on February 27, 2017 by HISD Communications. Houston Mayor Sylvester Turner and a team of volunteers from Booker T. Washington High School walked the neighborhood on Saturday, Sept. 10, 2016, knocking on doors and talking to dropouts about returning to school. They were part of a team of volunteers from HISD high schools participated in the district’s annual Grads Within Reach walk and convinced students across the city to come back to school and continue their education. This entry was posted in High Schools, News and tagged dropout prevention, graduation on September 12, 2016 by HISD Communications. HISD’s Drop Out Prevention Office is looking for volunteers to help with HISD’s annual Grads Within Reach walk, which will take place 8 a.m. to 12 p.m. on Saturday, Sept. 10, 2016. Please help us visit the homes of students who have not returned for the 2016-2017 school year. These students must re-enroll in high school to complete the basic requirements for a high school diploma. If you can help, fill out this form to register to walk with a group from the HISD high school of your choice. You will be able to select a high school when you complete the form. For training materials, please email CSantos2@HoustonISD.org and a packet will be sent to you. For more information, click here. For questions, please contact the Drop Out Prevention Office at 713-556-7017. This entry was posted in High Schools and tagged dropout prevention, graduation on August 31, 2016 by HISD Communications. This entry was posted in Achievement/Recognition, High Schools, News and tagged Class of 2016, graduation on May 27, 2016 by HISD Communications. A student from Davis HS at the 2015 graduation ceremony. 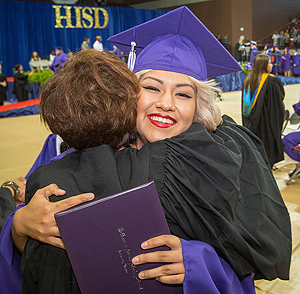 Hundreds of HISD students will take their first steps into adulthood this spring, when they walk across a stage to collect their diplomas as part of the district’s annual graduation ceremonies. Most ceremonies will take place at various locations around the city (primarily the Barnett Fieldhouse, Butler Fieldhouse, NRG Arena/Stadium, Texas Southern University campus, and Williams Pavilion) between Friday, May 27, and Sunday, May 29. However, a few will be taking place earlier (Leland College Prep on Tuesday, May 24; E-STEM on Thursday, May 26) or later (Liberty HS on Sunday, June 12), so be sure to check the schedule here for details. You can also find it at www.HoustonISD.org/GraduationCalendar. This entry was posted in High Schools, Special events and tagged graduation on March 2, 2016 by HISD Communications. On May 31, Young Women’s College Preparatory Academy (YWCPA) celebrated its first graduating class at the University of Houston’s Cullen Performance Hall. This entry was posted in District IV - Jolanda Jones, High Schools, New schools and tagged graduation, Paula Harris, young women's college prep academy on June 1, 2015 by HISD Communications.